Our paper, titled "Online Social Network Evolution: Revisiting the Twitter Graph," received the best student paper award at the 2016 IEEE International Conference on Big Data (IEEE BigData 2016). George Pallis received his BSc (2001) and Ph.D. (2006) degree in Department of Informatics of Aristotle University of Thessaloniki (Greece). Currently, he is assistant professor at the Computer Science Department, University of Cyprus and Associate Director of Laboratory of Internet Computing. 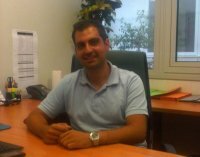 Previously, he was lecturer and Marie-Curie fellow at the the Computer Science Department, University of Cyprus. His research interests include Cloud computing with focus on Cloud elasticity and monitoring, Edge Computing and Big Data Analytics. He is principal institutional investigator in research projects funded by EC, Research Promotion Foundation in Cyprus, and industry (e.g., Google) and has totally attracted more than 3.7M euro. Dr. Pallis has published over 70 papers in international journals (e.g., IEEE TKDE, IEEE TCC, IEEE TSC, ACM TOIT etc), magazines (e.g., CACM, IEEE Internet Computing) and conferences (e.g., INFOCOM, IPDPS, ICDCS, IEEE BIG DATA etc) and he is contributor of the first international DIN (German Institute for Standardization) SPEC standard. Dr. Pallis has served as PC-Co-chair of CloudCom 2018 and CCGrid 2019. Dr. Pallis has also served in numerous Program and Organization Committees for international conferences and he received the best paper awards in the IEEE Big Data Conference (IEEE BIG DATA 2016) and the International Conference on Service-Oriented Computing (ICSOC 2014). He is Editor in Chief in the IEEE Internet Computing magazine, Associate Editor in the IEEE Transactions on Cloud Computing, Associate Editor in the Computing Journal and editor of the “View from the Cloud” department at IEEE Internet Computing Magazine. Dr. Pallis is one of the contributing experts for the EU Roadmap for Advanced Cloud Technologies under H2020. Proceedings of the 2016 IEEE International Conference on Big Data (IEEE BigData 2016), Whashington, DC, USA, December 2016. H. Efstathiades, D. Antoniades, G. Pallis, M. D. Dikaiakos, Z. Szlávik and R.-J. Sips, "Online Social Network Evolution: Revisiting the Twitter Graph"
Proceedings of the 12th International Conference on Service Oriented Computing. Paris, France, 3-6 November, 2014. G. Copil, D. Trihinas, H-L. Truong, D. Moldovan, G. Pallis, S. Dustdar, M. D. Dikaiakos. ADVISE -- a Framework for Evaluating Cloud Service Elasticity Behavior. IEEE Transactions on Services Computing, accepted. Proceedings of the IEEE Workshop on Hot Topics in Web Systems and Technologies (HotWeb 2015), Washington, USA, November 12-13, 2015. Proceedings of the 1st IEEE International Conference on Collaboration and Internet Computing, Hangzhou, China, October 27-30, 2015. Proceedings of the 2015 IEEE/ACM International Conference on Advances in Social Networks Analysis and Mining (ASONAM 2015), Paris, France, August 25-28, 2015. Proceedings of the 26th International Conference on Database and Expert Systems Applications - DEXA 2015 Valencia, Spain September 1 - 4, 2015. Proceedings of the Workshop on Clusters, Clouds and Grids for Life Sciences In conjunction with CCGrid 2015 - 15th IEEE/ACM International Symposium on Cluster, Cloud and Grid Computing, May 4-7, 2015, Shenzhen, Guangdong, China. Proceedings of the EuroPar 2014, Porto, Portugal, August 2014. Proceedings of the 14th IEEE/ACM International Symposium on Cluster, Cloud and Grid Computing. Chicago, IL, USA, May 26-29, 2014. Proceedings of IEEE/WIC/ACM International Conference on Web Intelligence, Atlanta, USA, November, 2013. Proceedings of the 10th International Conference on Mobile Web Information Systems (MobiWIS 2013), Springer LNCS, Paphos, Cyprus, August, 2013. Proceedings of Vehicular Traffic Management for Smart Cities (VTM 2012) Workshop, in conjunction with IFIP Wireless Days 2012, IEEE, November 21-23, 2012, Dublin, Ireland. Demonstrations G. Pallis et. al. LINC focuses its research activities on three important areas of Internet Computing, namely Cloud and Grid computing, Web data management and Vehicular computing. The UNICORN project aims to simplify the design, deployment and management of secure and elastic –by design-multi-cloud services. This will be achieved by a) development and design libraries that will provide security enforcement mechanisms, data privacy restrictions, monitoring metric collection and resource management; b) enabling continuous orchestration and automatic optimization of portable and dynamic cloud services running on virtual instances or micro-execution containers for increased security, data protection privacy and vast resource (de)-allocation. The iSocial consortium, which consists of 7 full partners and 6 associate partners, envisions the emergence of distributed and scalable overlay networking and distributed storage infrastructures that will provide support for open social networks and for innovative social network applications, preserving end-user privacy and information ownership. The main objective of iSocial is to provide world class training for a next generation of researchers, computer scientists, and Web engineers, emphasizing on a strong combination of advanced understanding in both theoretical and experimental approaches, methodologies and tools that are required to develop Decentralized Online Social Networking platforms. iSocial training network will fund 11 Ph.D. students and 5 post-doctoral fellows. To meet this goal, iSocial is divided into four interconnected research topics, which include important and timely research challenges with a high exploitation potential: i)Overlay Infrastructure for Decentralized Online Social Networking Services; ii)Data storage & distribution; iii)Security, privacy & trust; iv) Modelling and Simulation. The vision of the PaaSport project is to resolve the application portability issues that exist in the Cloud PaaS market through a flexible and efficient deployment and migration approach. To this end, PaaSport will combine Cloud PaaS technologies with lightweight semantics in order to specify and deliver a thin, non-intrusive Cloud-broker (in the form of a Cloud PaaS Marketplace), to implement the enabling tools and technologies, and to deploy fully operational prototypes and large-scale demonstrators. CAMF has been selected to receive an AWS in Education Research grant for the next two years. The grant will enable the CAMF community to utilise Cloud services from AWS for all facets of development, testing, demo and training. Arun Iyengar, Ashish Kundu, George Pallis. IEEE Internet Computing, special issue on "Healthcare Informatics and Privacy"
G. Fortino, C. Mastroianni, G. Pallis, M. Pathan, A. Vakali. Computer Networks, special issue on "Internet-based Content Delivery"
Marios D. Dikaiakos, Dimitrios Katsaros, George Pallis, Athena Vakali. IEEE Internet Computing special issue (Sep. 2009) on Cloud Computing. Editorial Advisory Board Member of the book "Advancements in Distributed Computing and Internet Technologies: Trends and Issues". Co-editor of the book “Web Data Management Practices: Emerging Techniques and Technologies.” Idea Group Publishing. Program co-Chair of the 19th IEEE/ACM International Symposium on Cluster, Cloud, and Grid Computing (CCGrid 2019), May 2019. Workshop co-chair of the "Online Social Networks: Emerging Trends in Research and Innovation", Oct 2014. Local organization co-chair of 10th IEEE IFIP Annual Mediterranean Ad Hoc Networking Workshop. Workshop co-chair in the 6th IEEE International Workshop on UPGRADE-CN 2011 in conjunction with CCGrid 2011. Workshop co-chair in the 5th IEEE International Workshop on Content Delivery Networks (CDN 2010) in conjunction with CCGrid 2010. Demos & Exhibits Co-Chair in the International Conference: 2010 High Performance Computing & Simulation (HPCS’10). Poster Chair in the International Conference: 2009 High Performance Computing & Simulation (HPCS’09). Poster Chair in the International Conference: 2008 High Performance Computing & Simulation (HPCS’08). International Workshop on Data-intensive Process Management in Large-Scale Sensor Systems (DPMSS 2014): From Sensor Networks to Sensor Clouds", CCGrid Workshop 2014.
International Workshop on Data-intensive Process Management in Large-Scale Sensor Systems (DPMSS 2013): From Sensor Networks to Sensor Clouds", CCGrid Workshop 2013.
International Workshop on Data-intensive Process Management in Large-Scale Sensor Systems (DPMSS 2012): From Sensor Networks to Sensor Clouds", CCGrid Workshop 2012. 2nd International IEEE workshop on Collaboration and Cloud Computing, 2010. External reviewer for several International Conferences: EDBT 2004 International Conference, AI 2003 International Conference, Scientific encyclopedia – IDEA Group Publishing, CoopIS 2004 International Conference, LA-WEB 2005 International Conference, LA-WEB 2006 International Conference, SOFSEM 2006 International Conference, ISMIS 2005 International Conference, ISCIS 2006 International Conference, La-Web 2007 International Conference, IEEE/WIC/ACM International Conference on Web Intelligence 2007, Intelligent Web Interaction 2007 Workshop, International Symposium on Intelligent and Distributed Computing - IDC'2007, ADBIS 2007, ISMIS 2008, Euro-Par 2008, ICDE 2008, ICDM 2008, PAKDD 2009, Euro-Par 2010, Euro-Par 2012, ICWS 2012. Member of the organization committee of Logipaignion.